Combined with the Okavango Delta, the Chobe National Park offers Botswana's most well-known conservation area. The Park is famous for its concentrations of elephant - some 120 000 individuals, along with large populations of buffalo, antelope and predators. Bird species also flourish with many migrants visiting from November to March. Arrive in Victoria Falls, Zimbabwe where you are met and escorted to your hotel. This afternoon enjoy a sundowner cruise on the Zambezi River. Morning transfer to Kasane for your departure flight. 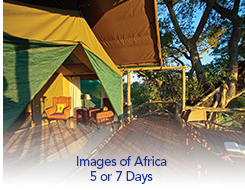 Enjoy one last morning activity in the Okavango Delta. Scheduled light aircraft transfer to Maun. Connect with departure flight.